looks great...wish i could see more detail! Looks great! Love that watch, too! am a fan of this look. I LOVE IT! I shall order once I get my allowance...which will probably be on May since I already spent my April allowance for some clothes online D: But I really really waaaant iiiittt ! Thanks for stopping by my blog ! Cute skirt and love your watch ! Where is it from ? you look great, amazing shoes and rings! Very cool, and such amazing shoes! Wowie, you made this skirt? I'm impressed haha, you are talented! Gorgeous, can't wait for the tutorial! You are totally rocking those shoes! Can't wait for your tutorial! i loved that skirt! Thanks for stopping by my blog! 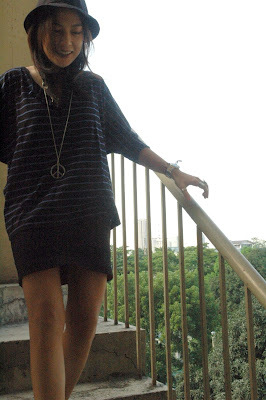 Love your style!! You look great! so cute! i love that top and necklace! 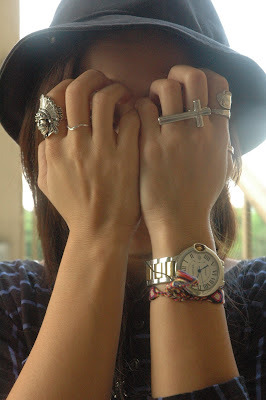 Loving all your rings too!! I think its amazing that you made that skirt! I love your DIY bandage skirt and love even more the way you've styled and accessorized it. Those rings are so cool! You look so pretty and charming! Super cute skirt, it turned out so well!!!! Where did you get those shoes they are too high and too amazing I need a pair of those. And you look gorgeous!! Really pretty and the outfit is awesome. this is such a great look! :) love the hat. another lovely shoes! haha! love the diy bandage skirt. blogging and earning is really a great idea. i should have said, earning while blogging.